Hsuan Hua (Traditional Chinese: 宣化上人; Hanyu Pinyin: Xuān Huà Shàng Rén, literal meaning:"proclaim and transform") (April 16, 1918 – June 7, 1995), also known as An Tzu and Tu Lun, was an influential Ch'an Buddhist monk and an important figure in the development of Western Buddhism in the United States during the twentieth century. Hsuan Hua was the ninth lineage holder of the Guiyang Ch'an School of Buddhism (潙仰宗), one of the five Ch'an families (Caodong, Linji, Fayan and Yunmen) and was granted dharma transmission from that lineage by the Venerable Master Hsu Yun, one of the most influential Buddhist teachers of the nineteenth and twentieth centuries. Hsuan Hua was one of the first known Chinese Buddhist Ch'an masters to transmit orthodox East Asian Buddhism to the West and ordained some of the first native-born Buddhist monks in the United States. 1.6.1 "Monk in the Grave"
Hsuan Hua, a native of Shuangcheng County of Jilin Province, was born Bai Yushu (白玉書) on April 16, 1918. His father was diligent and thrifty in managing the household. His mother was a Buddhist and a vegetarian who recited the Buddha's name daily. When she was pregnant, she constantly prayed to the Buddhas and Bodhisattvas for her child's well-being. It is said that in a dream the night before his birth, she saw Amitabha emitting a light. Shortly after, she gave birth to her youngest son. When the master was born, the room was filled with a fragrance. For three days and nights, Yushu cried continuously, considered a possible sign of his deep sympathy for beings suffering birth and death. As a child, Yushu followed his mother's example, eating only vegetarian food and reciting the Buddha's name. Yushu was quiet and uncommunicative by nature, but had a righteous and heroic spirit. At the age of eleven, upon seeing a neighbor's infant who had died, he became aware of the great matter of birth and death and the brevity of life, and resolved to leave secular life. At the age of 12, he heard of someone who later became a great Buddhist master, who had attained enlightenment by practicing the philosophy of filial piety. Following this person's example, Yushu began to repent for being unfilial to his parents in the past and decided to bow to his parents every morning and evening as a way of acknowledging his faults and repaying his parents' kindness. He gradually became renowned for his filial conduct, and people in the village called him "Filial Son Bai." At 15, under the Venerable Chang Zhi, he took refuge in the Triple Gem (Buddha, the teachings of Buddha and the community of enlightened ones) and formally became a Buddhist. He began to attend school and studied texts of various Chinese schools of thought, and the fields of medicine, divination, astrology, and physiology. During his student years, he also participated in the Path of Virtue Society and other charitable societies. He explained the Sixth Patriarch's Sutra, the Diamond Sutra, and other sutras for those who were illiterate, and started a free school for those who were poor and needy. When he was 19 years old, Yushu's mother died, and he requested his master's permission to leave secular life. (Young monks cannot be ordained without the permission of the parents; both of Yushu’s parents were now dead.) He became a monastic under the Dharma name An Tzu (安慈). An Tzu built a simple hut of sorghum thatch by his mother's grave and observed the practice of filial piety for three years. During that period, he made 18 great vows, paid reverence to the Avatamsaka Sutra, performed worship and pure repentance, practiced Ch'an meditation, studied Buddhist teachings, ate only one meal a day, and did not lie down to sleep at night. An Tzu won the admiration and respect of the villagers. His intensely sincere efforts to purify and cultivate himself led to occurrence of auspicious omens. As news of these supernatural events spread, An Tzu came to be regarded as an extraordinary monk. The five schools will divide into ten to teach and transform living beings: a hundred and then a thousand, until they are endless, … countless like the sands of the Ganges … the genuine beginning [of Buddhism] in the West. When An Tzu's observance of filial piety was completed, he practiced asceticism in seclusion. Later he returned to the monastery where his master, the Venerable Chang Zhi, had once been the leader, and was chosen to be the abbot. During the period that he lived in Manchukuo, An Tzu concentrated on understanding each student’s potential and offering appropriate teachings. In 1948, Hsuan Hua left Guangzhou, bid farewell to Master Hsu Yun and went to Hong Kong to propagate Buddhism. Hsuan Hua gave equal importance to the five schools—Ch'an, Doctrine, Vinaya, Esoteric, and Pure Land—thus putting an end to sectarianism. Hsuan Hua also renovated and built temples, printed sutras and constructed images. He lived in Hong Kong for more than ten years and had his first substantial experience of Western culture. After Hsu Yun passed away in 1959, and Hsuan Hua completed the proper ceremonies in his memory, he felt it was time to pursue his Dharma mission in the West. Several of his lay disciples from Hong Kong had already gone to the United States to study. He instructed them to establish a Buddhist association. It was established in the United States as the Buddhist Lecture Hall, later renamed the Sino-American Buddhist Association and then the Dharma Realm Buddhist Association. Hsuan Hua traveled to Australia in 1961 to investigate the conditions for the growth of Buddhism there. After a difficult year, he returned to Hong Kong in 1962. That same year, at the invitation of his Buddhist disciples in San Francisco, Hsuan Hua traveled alone to the United States. His intent was to "come to America to create Patriarchs, to create Buddhas, to create Bodhisattvas". Each of you now meets a monk in the grave. Above there is no sun and moon, below there is no lamp. Affliction and enlightenment—ice is water. Let go of self-seeking and become apart from all that is false. When the mad mind ceases, enlightenment pervades all. Enlightened, attain the bright treasury of your own nature. Basically, the retribution body is the Dharma body. At the Sutter Street location Hsuan Hua started having regular contact with young Americans who were interested in meditation. Some came daily to his public meditation sessions from seven to eight o'clock every evening, and many also attended his sutra lectures. Translators were hired for those who could not understand Chinese; on some occasions, Hsuan Hua himself spoke to them in English to the best of his ability. In 1967, Hsuan Hua moved the Buddhist Lecture Hall back to Chinatown, locating it in the Tianhou Temple. There he lectured on the Verses of the Seven Buddhas of Antiquity and the "Universal Door" Chapter of the Lotus (Dharma Flower)Sutra. In the spring of 1968, a group of university students at the University of Washington in Seattle wrote to Hsuan Hua and requested that he come to Seattle to lead a week-long meditation session. Hsuan Hua replied with an invitation to a Buddha-recitation session and a Chan (Zen) meditation session, each a week long, held at the Buddhist Lecture Hall in San Francisco. In the summer of 1968, Hsuan Hua held a Shurangama Study and Practice Summer Session. Over 30 students from the University of Washington in Seattle came to study the Buddha’s teachings. After the session was concluded, five young Americans (Bhikshus Heng Chyan, Heng Jing, and Heng Shou, and Bhikshunis Heng Yin and Heng Ch'ih) requested permission to shave their heads and become monks, beginning the tradition of native-born Sangha in American Buddhism. promoting wholesome education through the establishment of schools and universities. Increasing numbers of people wished to leave secular life and become monks and nuns under Hsuan Hua's guidance. In 1972 he organized the first formal, full ordination ceremonies for Buddhist monks and nuns to be held in the West at Gold Mountain Dhyana Monastery, and invited elder masters to preside with him over the ordination platform. Two monks and one nun received ordination. Subsequent ordination platforms were held at the City Of Ten Thousand Buddhas in 1976, 1979, 1982, 1989, 1991, and 1992, and progressively larger numbers of people received full ordination. Over 200 people from countries all over the world were ordained in these ceremonies. Hsuan Hua supported the Śūraṃgama-sūtra (usually spelled Shurangama Sutra or Surangama Sutra in English), a Mahayana sutra and one of the main texts used in the Chan school in Chinese Buddhism, which emphasized the worthlessness of the Dharma when unaccompanied by meditational ability (see samadhi) and the importance of moral precepts as a foundation for the Path. He felt that Buddhism in China had in many cases degenerated into superstition and the practice of rituals and ceremonies without an underlying discipline and cultivation of a moral life. He hoped that by propagating Buddhism in the West, where it had no historical tradition, he could demonstrate the genuine principles of Buddhism. While encouraging his disciples to learn the ancient traditions, he cautioned them against mistaking cultural overlay and ignorant superstition for the true Dharma, and encouraged them to understand the logical reasons behind the ancient practices. Among his reforms, Hsuan Hua re-established the wearing of the precept sash (kashaya) as a sign of a member of the Sangha; emphasized dietary and ascetic practices; and promoted a simple code of conduct, Six Great Guidelines: not contending, not being greedy, not seeking, not being selfish, not pursuing personal profit, and not lying. He also attempted to heal the two thousand year old rift between Mahayana and Theravada monastic communities by encouraging cordial relations between the Sanghas, inviting distinguished Theravada monks to preside with him in monastic ordination ceremonies, and initiated talks aimed at resolving areas of difference. On June 7, 1995, Hsuan Hua died in Los Angeles at Cedars-Sinai Medical Center from complications of exhaustion. His funeral lasted from June 8 to July 29, 1995, and was attended by more than 2000 disciples from the United States, Canada, and various Asian and European countries. After the funeral, memorial services commemorating Hsuan Hua's life were held in various parts of the world, including Taiwan, mainland China, and Canada. His sarira, pearl or crystal-like bead-shaped objects that are purportedly found among the cremated ashes of Buddhist spiritual masters, were distributed to many of his temples, disciples and followers. Hsuan Hua had traveled to Thailand and Burma in his youth to investigate the Southern Tradition of Buddhism, and wished to heal the 2000-year-old rift between the Northern (Mahayana) and Southern (Theravada) traditions. In the United States, he encouraged cordial relations between the Sangha communities from both the Northern and Southern traditions and set a personal example. On the occasion of the opening ceremony for the Dharma Realm Buddhist University, he presented Venerable K. Sri Dhammananda of the Theravadin tradition with an honorary Ph.D. Hsuan Hua also regularly invited Bhikkhus from both traditions to jointly conduct the High Ordination. Hsuan Hua often referred to Buddhism as the “teaching of living beings.” He believed that sectarian divisions within Buddhism were not in the true spirit of the Dharma, and felt that it was important for people of all religions to learn from the strengths of each religious tradition. He invited Paul Cardinal Yu Bin, the Catholic cardinal of Taiwan, to join him in establishing a World Religions Center at the Sagely City of Ten Thousand Buddhas and to be its first director. He suggested that the cardinal be a "Buddhist among the Catholics" and that he himself would be a "Catholic among the Buddhists." The cardinal's untimely death delayed plans for the Center, which opened in Berkeley in 1994 as the Institute of World Religions. Dharma Realm Buddhist University hosted a World Religions Conference in 1987 at the Sagely City of Ten Thousand Buddhas, and the same year Hsuan Hua gave an address at the Third International Buddhist-Christian Dialogue Conference in Berkeley. He once gave a eulogy at Grace Cathedral in San Francisco, and was invited in 1989 to the Quaker Retreat Center at Pendle Hill, Pennsylvania to give a series of talks, and in 1992 to be the guest speaker at the yearly Vedanta Society gathering at Olema, California. He also maintained an ongoing friendship with Father John Rogers, Catholic Chaplain of Humboldt State University. Hsuan Hua felt that one of the weaknesses of Buddhism in China was that it did not emphasize education and failed to develop a widespread network of Buddhist schools and universities. In the West, he founded Dharma Realm Buddhist University, primary and secondary schools, and developed financial aid programs for students. Dharma Realm Buddhist University was established in 1976, with its main campus at the Sagely City of Ten Thousand Buddhas. The University currently offers undergraduate and graduate degrees in Buddhist Study and Practice, Translation of Buddhist Texts, Buddhist Education, and Chinese Studies. In 1982 Hsuan Hua established the Sangha and Laity Training Programs. The Laity Training Program emphasizes Buddhist Studies and Practice for lay people in a monastic setting, with an emphasis on moral discipline. The Sangha Training Program teaches religious practice, monastic discipline and temple management. Hsuan Hua founded an elementary school, Developing Goodness School, in 1976. It offered a bilingual Chinese-English curriculum and taught the fundamentals of both Western and Chinese cultural heritages. Instilling Virtue Secondary School opened its doors in 1980, and a separation into boys' and girls' schools occurred in 1981. The mountain gate to the City of Ten Thousand Buddhas, Mendocino County, California. The City Of Ten Thousand Buddhas (萬佛聖城, Wànfó Shèngchéng), an international Buddhist community and monastery founded by Hsuan Hua, is one of the first Chinese Zen Buddhist temples in the United States, and one of the largest Buddhist communities in the Western Hemisphere. The city is situated in Talmage, Mendocino County, California about 2 miles (3.2 km) east of Ukiah, and 110 miles (180 km) north of San Francisco. It was one of the first Buddhist monasteries built in the United States. The temple follows the Guiyang Ch’an School, one of the five houses of classical Chinese Ch'an. The city is noted for their close adherence to the vinaya, the austere traditional Buddhist monastic code. 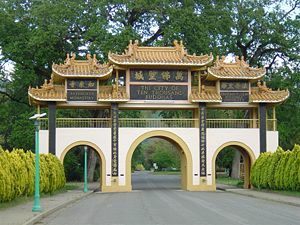 From July 18 to the 24th of 1987, Hsuan Hua hosted the Water, Land, and Air Repentance Dharma Assembly, a centuries old ritual often regarded as the "king of dharma services" in Chinese Buddhism, at the City of Ten Thousand Buddhas, and invited over seventy high Sangha members from mainland China to attend. This was the first time the service was known to have been held in North America, and was a historical assembly because of the cooperation between the American and Chinese Sangha. On November 6th, 1990, Hsuan Hua sent his disciples to Beijing to bring the Dragon Treasury (Long Zang) edition of the Buddhist canon back to CTTB, symbolizing a further advance in the relationship between Eastern and Western Buddhism and the transmission of the Buddha’s teachings to the West. In 1991, several of Hsuan Hua’s disciple nuns were invited to reside as visitors at Mingru Monastery in Jilin, China, where they participated in the daily monastic life, gave public talks, and lectured on the precepts to the resident nuns. In 1995, the American monks Heng Sure, Heng Lyu and Heng Bin went to Shanghai, China, to take part in the transmission of the Complete Precepts at Dragon Flower (Longhua) Monastery at the invitation of Venerable Ming Yang. ↑ Ron Epstein (Upasaka Guorong), DRBA Founder's Biodrba.org. Retrieved November 15, 2008. ↑ DRBU Info. Dharma Realm Buddhist University. Retrieved November 15, 2008. ↑ Dharma Realm Buddhist Association Laying the Foundation Retrieved November 15, 2008. ↑ The Sagely City of Ten Thousand Buddhas A recollection of my causes and conditions with the Venerable Master Hsu Yun, Hsuan Hua. Retrieved November 15, 2008. ↑ Ronald Epstein, (1995). "The Venerable Master Hsuan Hua Brings the Dharma to the West." In Memory of the Venerable Master Hsuan Hua, Volume One. (Burlingame, CA: Buddhist Text Translation Society), 59-68. Reprinted in The Flower Adornment Sutra, Chapter One, Part One “The Wondrous Adornment of the Rulers of the Worlds; A Commentary by Venerable Master Hsuan Hua. (Burlingame, CA: Buddhist Text Translation Society, 2004), 274-286. ↑ Dharma Realm Buddhist Association Hsuan Hua Masters and Their Organisations Retrieved November 16, 2008. ↑ Charles Prebish, "Ethics and Integration in American Buddhism." Journal of Buddhist Ethics 2 (1995). ↑ Ronald Epstein, “The Śūraṅgama-sūtra with Tripiṭaka Master Hsüan-hua’s Commentary An Elementary Explanation of Its General Meaning: A Preliminary Study and Partial Translation.” (Ph.D. Dissertation. University of California at Berkeley, 1975). ↑ DRBU Info Dharma Realm Buddhist University Retrieved November 15, 2008. ↑ Chan: the Essence of All Buddhas. Retrieved December 13, 2008. ↑ Guanyin, Guanyin, Guanshiyin. Retrieved December 13, 2008. Epstein, Ronald, “The Heart Sūtra and the Commentary of Tripiṭaka Master Hsüan Hua.” Master’ Thesis, University of Washington, 1969. Epstein, Ronald, “The Śūraṅgama-sūtra with Tripiṭaka Master Hsüan-hua’s Commentary An Elementary Explanation of Its General Meaning: A Preliminary Study and Partial Translation.” Ph.D. Dissertation. University of California at Berkeley, 1975. Epstein, Ronald, "The Venerable Master Hsuan Hua Brings the Dharma to the West." In Memory of the Venerable Master Hsuan Hua, Volume One. Burlingame, CA: Buddhist Text Translation Society, 1995. 59-68. Reprinted in The Flower Adornment Sutra, Chapter One, Part One “The Wondrous Adornment of the Rulers of the Worlds; A Commentary by Venerable Master Hsuan Hua. Burlingame, CA: Buddhist Text Translation Society, 2004, 274-286. Prebish, Charles, "Ethics and Integration in American Buddhism." Journal of Buddhist Ethics 2 (1995). This page was last modified on 16 January 2018, at 19:47.